Our featured structure for April in our 2019 calendar is based around a beautiful image of a virus that causes devastation to the world’s livestock population. Foot-and-mouth disease virus (FMDV) gained a lot of media coverage across the UK and Europe in 2001. Though the virus rarely infects humans, it can have a devastating effect on the human population by the disruption of the farming industry. There have been a number of outbreaks of the disease across the world, however this is an ongoing issue in many developing countries. The disease affects cloven-hoofed animals, such as cattle, sheep and pigs, and is highly contagious. The symptoms include fever, followed by blisters in the mouth or on the feet, which give rise to the name of the virus. Many international marketplaces prohibit the sale of meat contaminated with FMDV so outbreaks can have massive impact on agricultural exports, rendering the meat worthless. In the UK in 2001, attempts to prevent any further spread of the disease led to the slaughter of millions of animals, at an estimated cost of around £6 billion to the economy. Why does the disease spread so rapidly? FMDV is a picornavirus, part of the family Picornaviridae, which includes Rhinovirus (the common cold) and Poliovirus. This is a diverse family of viruses, however all contain genomic RNA within their protective icosahedral protein capsids. These protein capsids protect the RNA genome from incredibly harsh conditions as the virus is released into the environment to infect a new host. This enables the virus to survive outside a host organism for up to 14 days at room temperature, which can lead to large outbreaks of the disease, particularly in farms where there is a high density of animals. The cryo-EM structure of the FMDV capsid (PDB entry 5aca), shown in surface representation. In order for the virus to reproduce, the RNA needs to be delivered to the host cell. This is initiated by recognition of the virus particle by receptors on the cell surface. A flexible loop of protein on the virus surface interacts with receptors called integrins which sit on the surface of mammalian cells. This interaction occurs via a highly conserved region of this loop, containing an arginine-glycine-aspartate amino acid motif. There have been at least 4 different receptors of the integrin family that have been determined to recognise FMDV. Recognition of the virus ultimately leads to the RNA being injected into the host cell. In the cytoplasm of the host cell, the genome acts directly as an mRNA, hijacking the native ribosomes to produce viral proteins to create new viral capsids. Also encoded in the viral genome are non-structural proteins, involved in replication of the RNA, controlling further translation of proteins, and even stopping the production of host cell proteins. This all ensures maximum replication of the viral RNA genome and creation of mature virus particles, enough to cause the host cell to burst open, releasing these new viruses to continue to infect the host cells. There are currently 19 structures of the full FMDV capsid in the PDB, all solved by the group of Dave Stuart at the University of Oxford and Diamond Light Source. Most of these structures have been solved by X-ray crystallography, however more recent studies utilise both X-ray and cryo-electron microscopy (cryoEM) techniques to study the structure of these viral capsids. Many of these studies are focused on producing intact viral particles that do not contain the RNA genome required for replication of FMDV, and to prove that these exhibit a near-identical structure to that of the standard virus. The hope is that these ‘safe’ virus particles will aid development of new vaccines for FMDV that do not carry risk of causing infection and that can be easily produced on a large scale. Understanding the structure of these huge protein capsids may finally help to eradicate foot-and-mouth disease from the planet. The artwork in our calendar for April is a Silk Batik, created by Megan S. from Impington Village College, Cambridge. 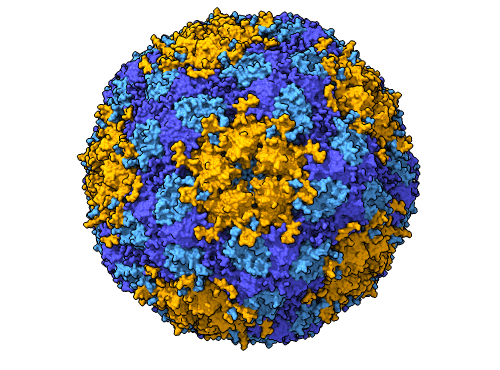 The piece features the spherical foot-and-mouth disease virus capsids, based on the PDB entry 5aca, depicted in blue, purple and orange against a backdrop of yellow.